Having a young family right now means that most times if I want to ride or only have an hour or two it means riding in the morning when it's the coldest and riding local. After the hunter sighting in the tree stand a couple of weeks ago I have been a little hesitant about riding where there could be hunters because it seems that are a lot more hunters out this year. Maybe it's the economy. Today's ride took me through Upper Paugussett State Forest and I figured it would be best to stick to the logging road and if there was time on the way back I would hit the Gussy Trail. Looks like someone lost a glove. Not uncommon given the forest gets a lot of use. I figure since the forest road gets the most traffic that riding up and down during hunting season is the safest place to ride. Though being oranged up and wearing bells helps a lot, too. Sorry, no Dillinger love or Houses of the Holy shots this ride. I must say though that I am really enjoying riding the Dillinger. Power transfer with the aluminum frame is awesome and post ride recovery after being a human shock absorber is down to a few hours now, used to be a few days! Like I said, maybe it's the economy or what but there seems to be many more hunters out in the forest these days. The guy below is from Fairfield but he didn't get any today largely because as he put it, too many Coyotes in the area. These two guys I met on the west side of the forest heading towards Hanover Rd. They's been hunting the west side all morning but didn't get any thing. In speaking with them I found out they lived across the street and hunted here all the time. They were complaining of Coyotes, too. From Upper Paugussett I hammered up Pond Brook Rd and then up Lake George on to the Lake George ROW which is a lot wetter these days. The MX/ATV crowd that uses this route from time to time (illegaly of course) armored one section of the trail in such a way that makes it difficult to negotiate I have been following the route the horsies go off to the side. These is one little section in that by pass that is hike-a-bike and today I found a way around it. To get around the big water/mud holes I have started formulating a trail of sorts. Remembering when to pick up the by pass is always a challenge because nothing is marked, not to mention when you are riding up from the Dingle Brook loop you hit the ROW at a point to pick up the bypass you have to back track a little and I always forget to do so. 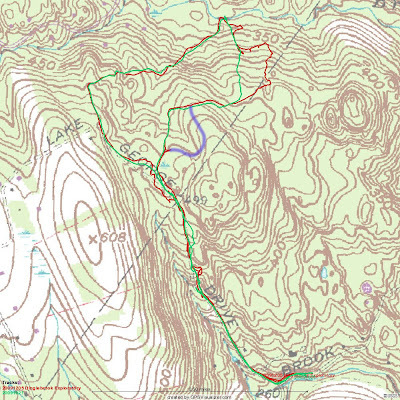 I spent some time bushwhacking coming up from the bench to see if I could find any paths in the woods as an alternate to the fall line, stoopid hiker, path the current trail follows. I can climb this section but I hate fall line climbs and would rather see a winding, curvy path up this ascent. Didn't really find any thing lower down but higher up it got better. One thing I do want to see is whether this bypass trail (marked in blue) connects to the trail that goes out back to the ROW. The problem with the trail today is that it winds up in a stream bed and it would be nice if there was a way around that. Maybe this is it. Riding back down Pond Brook I came across a bunch of trucks on the side of the road, obviously hunters in a little pow wow buy the bridge on the brook. I stopped to say hello and see how they did. One guy took a deer and had it in the back of the pick up. Turns out, I recognized one of the trucks belonging to the hunter that I saw on November 18th in a tree stand about 100 yards off the trail. The hunter turns out to be my plumber, Tim Conlan, and apparently he was hunting with a buddy that morning who was in another section that I rode right past and didn't even see!